I have been waiting too long! Welcome, everyone, to the Digital Music age! What, I missed the revolution? Not at all. I refused to purchase music that was locked into single platform and DRM‘d to death. Why would I pay for a song, only to end up not being able to listen to it on most of my PCs at home or on most of my mobile devices?! Even if my entire home was Apple (which it totally isn’t), there are still serious limits! You can always stop by your favorite store and purchase a CD with a music you want. Then, with few simple clicks, you would have your very own Compatible Unprotected music, so why buy into Apple’s jail?! Even if you love Apple devices that much, simple rip the CD onto it, and viola! Enter the Future! 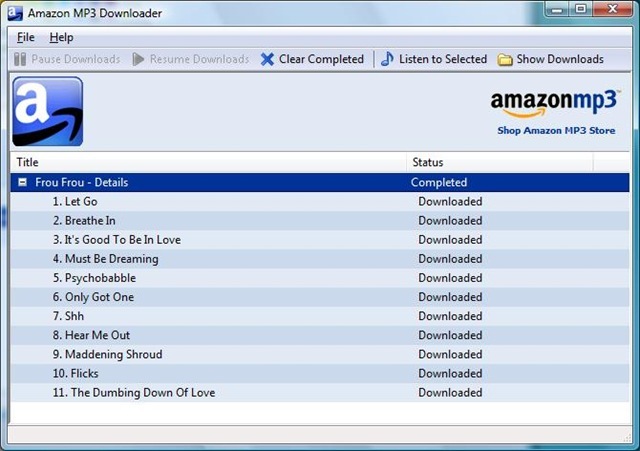 Finally, Unprotected High-Quality (256Kpbs) MP3 files can be purchased from a trusted place, non other than Amazon.com! Today I rushed forth and purchased my first complete digital album. The experience wasn’t flawless, but it was mostly due first time setup. Amazon asks you to download a tiny desktop application to manage your downloads in background. It looks straightforward enough, and easily configurable to tell it where to put the music on your PC, automatically. It will even auto-add it for you to Media Player or iTunes library, nirvana! Go ahead and try it, individual songs are as low as $0.89 and I finally have a digital music store I can wholeheartedly recommend! Just click through on excellent Frou Frou album in the blog’s side panel. Last thing for today, I know my Podcasts super-guide is way overdue. I started on draft, really! Meanwhile, let me just tell you that I use PodNova.com to organize my Podcasts and to auto-download new Podcasts to PC/Linux/Other platforms of your choosing. I downloaded the latest version of client and it seems simple enough, and works fine on Vista! Speaking of Vista, it’s been about 5 days since I installed my authentic Windows Vista Premium (which took about 10 minutes, btw!) and I love it! Of course this is just a start, and I am yet to try Video Editing and Graphics Editing, but everything else I tried went very well! So, Highly Recommended!! !